The Map shows the locations of spacetime portals in the Universe. By accessing these portals, you can travel instantly to other locations in time and space. 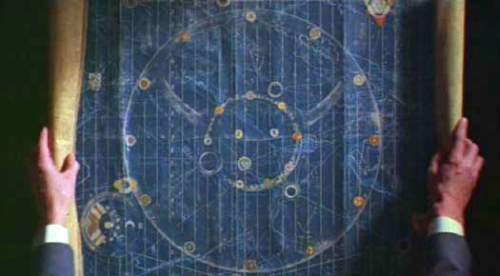 In the movie these portals are often found in weird locations, and the characters use them to explore and collect treasures from exotic places. The idea of owning such a map is compelling. I remember first watching the movie as a kid and getting a tingly feeling when I imagined the ability to travel the Universe like that. And I got that same tingly feeling again when I recently started exploring the Hypergrid on OpenSim. The hypergrid is an extension to opensim that allows you to link your opensim to other opensims on the internet, and that supports seamless agent transfers among those opensims. Hypergrid technology has existed for only about a year. But in that short time, it has evolved very quickly. Maria Korolov from HypergridBusiness has created a whole directory of Hypergrid destinations called Hyperica. You can use the directory to find Hypergrid teleport addresses between almost a hundred different OpenSim grids running around the world. There’s also a Hypergrid Teleport Network system called The HyperGates. Just rez a HyperGate object on your land and it will automatically connect to the HyperGate network, allowing visitors to click on the gate inworld and immediately begin exploring a wide range of locations on different OpenSim grids. All of this is an evolving technology. As such, sometimes thing simply don’t work. But in my experience over the past few days, things work much more often than not. Maria has also written a very helpful guide on How to Hypergrid for beginners. I recently set up my own OpenSim region on jokaydiaGrid. I named it “Pathlandia,” and one of the first things I did was rez a HyperGate and start exploring. Over the course of a few hours, I found myself jumping between different OpenSim grids, exploring strange new lands and finding lots of fun freebie items. I felt like a kid again. That same kid who fantasized about having a copy of The Map from Time Bandits. When I finally returned to Pathlandia, I rezzed all my freebies on my own land and sat dumbfounded under a tree. It’s one thing to theoretically understand the concept of a network of virtual worlds and the ability to carry your identity and inventory between them. It’s a completely different thing to actually do it. Now, more than ever, I am convinced that the cornerstone of the future Metaverse will involve such connectivity. Walled gardens will become stagnant tidal pools. Interconnected gardens will flourish. New Maps to discover and travel these locations will be the tools that tie it all together. And the speed with which technology like OpenSim and Hypergrid is advancing along these lines is, in a single word, breathtaking. Oh, in case you’re wondering who invented the whole Hypergrid technology, it was a someone named Crista Lopes (aka Diva Canto). A pioneering academic and educator. She’s an Associate Professor in the Department of Information at the University of California, Irvine. And before that, she was a research scientist at a little place you might have heard of called Xerox PARC. Crista is also an OpenSim core developer, and the main person behind the diva distribution of OpenSim that I recently used in my USB key project. Educators and academics today are closely re-examining their strategies for using virtual worlds. Large numbers of them are turning their attention for the first time to technologies like OpenSim, exploring its new affordances and quickly organizing in groups to coordinate their work. I wonder what they’ll come up with next? Whatever it is, I suspect it will be very clever. This entry was posted in Education, OpenSim, Pioneer Lessons, Uncategorized, Virtual Worlds and tagged education, HyperGate, HyperGrid, innovation, metaverse, online communities, pioneers, virtual worlds by John "Pathfinder" Lester. Bookmark the permalink. I agree with Hyper grids however my main consern is that all policies for such system could allow content to be stolen and transfered from one grid to the next without anyone knowing. Each grid owner sets their own policies. And content creators can set the permissions rights as usual on their items however they wish (free, copyable, no-copy etc.). As I was traveling to different grids, I noticed how some wouldn’t allow me to transfer any content I obtained from the grid to a different grid. On others, I could acquire freebie items and keep them with me in my inventory wherever I went. There are definitely challenges ahead in terms of setting up a trustworthy “universal currency” across these different grids, and making sure content creators can adequately protect their work and create viable businesses. This is what we have been waiting for. Some peeps I worked with developed inter-MOO protocols years back which allowed for just this, and ever since I started looking at SL, I’ve been waiting for HyperGrid. I can keep my SL sims for general public and now have our own grid for the heavy lifting in our lab. Great stuff. I’m happy you’re doing this now, so I can follow along 2 steps behind. Something like the hypergrid is most likely the way to go in the future. Compared with it SL (and other grids like Blue Mars too) is closed up, but I think that if the hypergrid grows big enough it’s weight will drive the others to find ways to interconnect with it and the size of the market will create the possibility for profits that are bigger then the risks through theft. Now of course there are many things to be done along the way (including standarts to allow interoperability) but the bigger the hypergrid becomes the bigger the gravitation effect will become that will pull other worlds towards it. And I would love to see all virtual spaces to gain the possibility to share and interconnect. Morgado, Leonel (2009). Interconnecting virtual worlds, Journal of Virtual Worlds Research, 3 (1), 4-7. I had not seen that paper of yours. Reading it now. Thank you! my virtual two cents . . .